Several months ago I was searching eBay, as many of you do, just to pass some time. 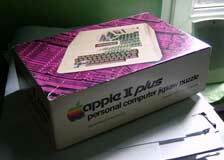 I discovered an item I never expected to find, since it’s incredibly rare – an original Apple II jigsaw puzzle. 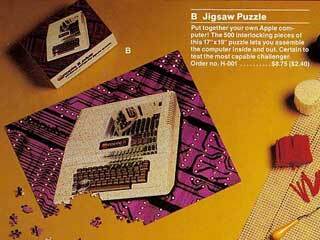 Back in 1983, Apple released a gift catalog featuring Apple-branded merchandize such as mugs, T-shirts, and, amongst many other items, an Apple II jigsaw puzzle. I bought it for 99 pence. Shortly after, it arrived – and, being so excited as I was, I put the jigsaw together. Here’s a scan from Apple’s 1983 Gift Catalog, showing the Apple II jigsaw puzzle which I accidently found. I had an item so rare that not even the almighty Woz could tell me anything about it! As I am also a NeXT computer fan, I also know that a NeXT Gift Catalog was also produced sometime in the 1990s featuring NeXT-branded merchandize. And who could’ve been involved in that? Steve Jobs. It’s more probable that he was also heavily involved in the production of Apple’s 1983 Gift Catalog, and he’s probably the reason that it existed in the first place. 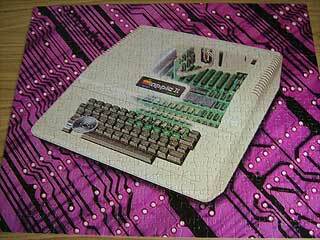 I have no idea how many of these jigsaws were produced, but I’m guessing it was quite a small production run. Not only this, but I have never seen any of the other items included in Apple’s Gift Catalog. This is definitely my best purchase ever from eBay, and it’s most certainly an item I never plan to sell. Apple Advertising and Brochure Gallery, Mac Mothership. Halfway down page, full scans of 1983 Apple Gift Catalog.